← Looking for a guide? Water temps are now in the mid 80’s for the most part in central Florida or by PM sun they’re there. Many anglers start at daylight & quit before it becomes unbearable with the heat or when their Right Guard fails…. is that still on the market??? Anyway you might be hanging it up too soon. I’m not sure if I’ve ever seen Mike Tacek throw a crankbait or ANYTHING that requires fast movement. 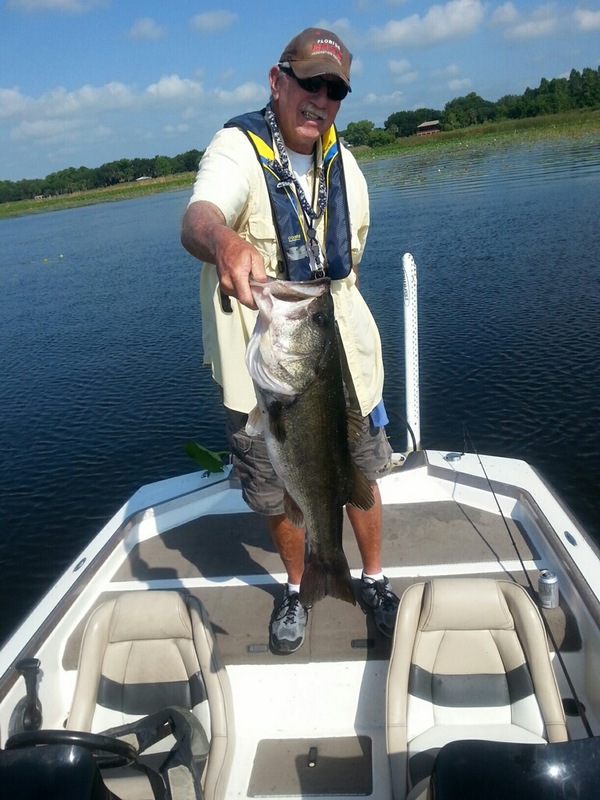 This isn’t the 1st Big Bass pot he’s captured & this 7.4 pounder made Mike’s ride home after the tournament more plea$ant. I’ve seen Mike pitchin a lot. Hmmm worm maybe!?!?! Wayne Barksdale, pitcured above, needs no introduction on here because if you look at archived posts, he’s been in several. Unlike me, Barksdale changes shirts making it easier to differentiate pictures….and NO it’s not the same bass – especially on this 1 above. So you’re hot & sweaty…. dressed to prevent your dermatologist from knowing you on a 1st name basis during a chance encounter….when all of a sudden THUMP….Barksdale said this fish ate a jig…..and if that wasn’t enough that appendage hanging out from the dorsal fin just happens to be worth $100….it’s a tag that FWC officials insert to track size & movement of fish. Talk about livin right!!! You’ve got a weekend tournament approaching so you go to the lake to “Pre-fish” ….even though you’ve been there dozens of times….It goes something like this – Last year I caught them there so we’ll check out another place….And they ate topwater early but as the day progressed you moved to edges of grass/pads/hyrdilla then deep….you get the idea. 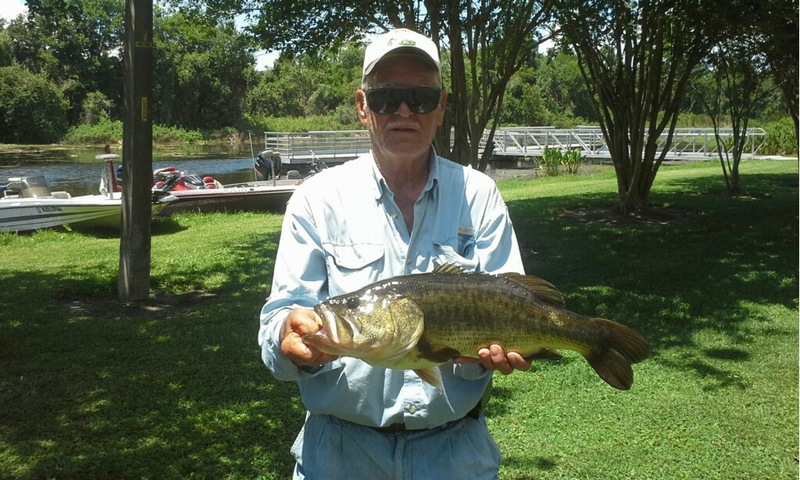 Below is tournament angler John Hendry who’s another “getting to be” regular on here, pre-fishing Lake Istokpoga…. 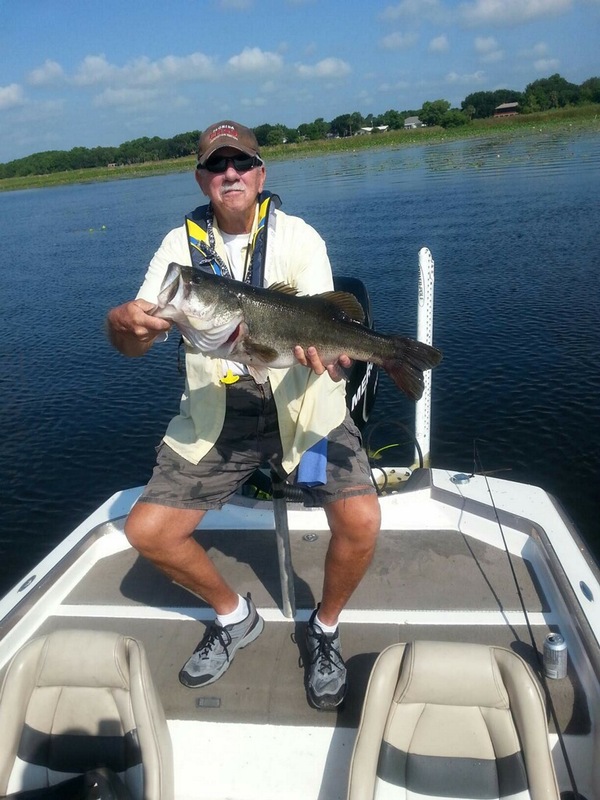 Hendry sends me a text showing this “Not 1o but maybe 11 pounder” ….his words…. 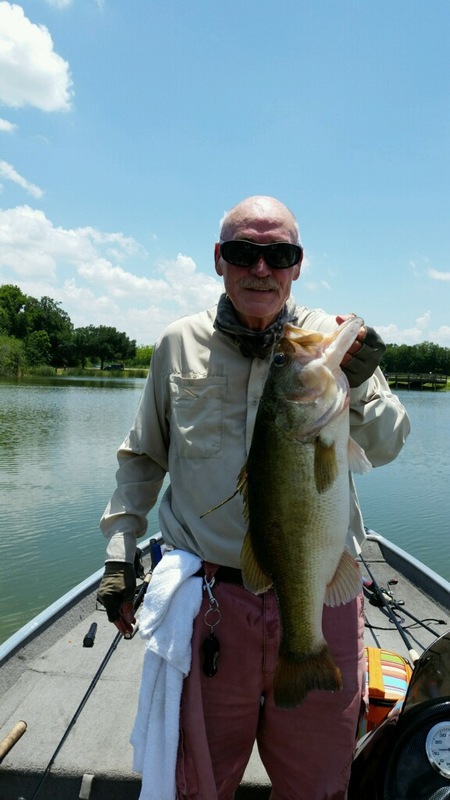 that he caught 5/22/15 while casting a speedworm…. inside Hendry is pleased with his catch BUT there’s 1 problem…. it’s the day BEFORE the tournament…. at least Hendry knows where it lives & if nothing else may be able duplicate or set up a pattern. All 3 anglers didn’t give up much info as for colors, size, & tactics of tossing lures, but rest assure, it’ll change by the next time they venture out. As for me, the ONLY way I’m gonna catch one is NOT beating the keyboard. I haven’t done any good in a month other than small fish but after reading this I hope it gets you out of the AC and on the water. It has me. Nice Bass guy’s. I guess I left before any Big Bass were awake (6:15 AM to 10:30 AM). Awesome!